Who doesn't enjoy a good snowman. This is one that won't melt when the weather warms and the sun shines. 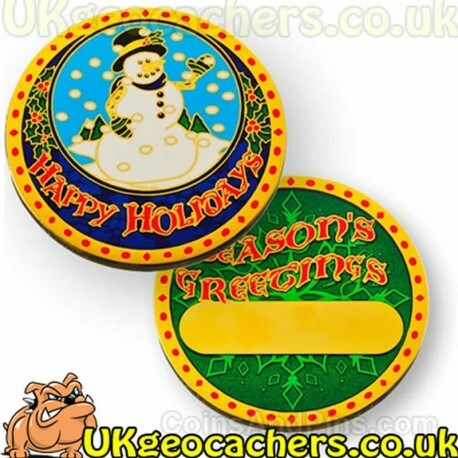 A truly lovely geocoin that is a great way to show some festive spirit. Plated in polished gold it would be a lovely coin to release, as a gift or to add to your coin collection. Featuring a snowman and holly. The high quality of this coin makes it a great gift idea. The back of the coin even have a place set so that you can take it into an engravers and add a personal message directly to the coin.